The following picture shows the broken oil control ring positioned on a granite flat surface. Note the upward bend on the broken side of the ring. The cause of failure would be the ring not being sufficiently compressed and was damaged during installation. Rings not installed correctly allow a combustion path to the crankcase causing high crankcase pressure “blow by” and loss of power. The picture shows the oil control ring broken in several areas (yellow arrow). The most likely cause of failure would be the ring was damaged during installation. 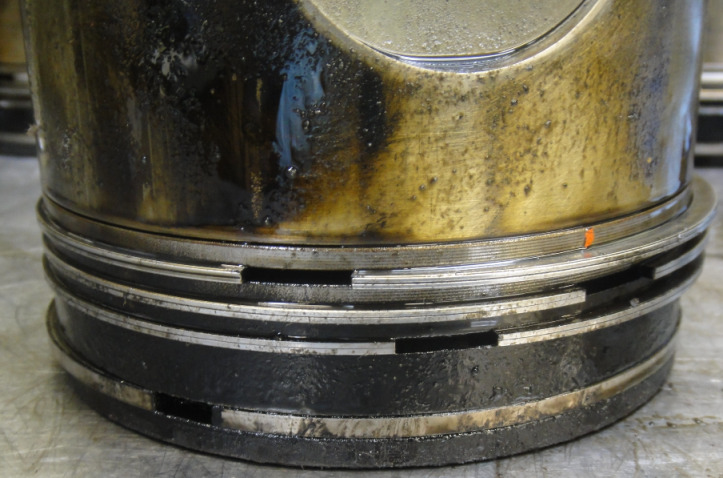 Observations-4 ring sets were examined for possible cause of excessive oil consumption. The top compression ring and intermediate rings were examined under magnification. During the inspection process, noticeable vertical scratching of the ring faces was found. 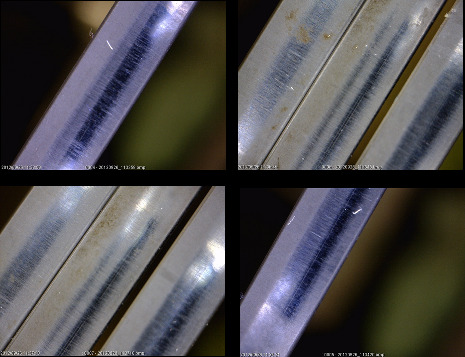 Scratching of the ring faces will cause incomplete sealing of the power cylinder and can cause excessive oil consumption. 1) Leaks in the air intake system. 2) Abrasives in the engine oil. 3) Poor cleanliness during assembly. No manufacturer defects were observed in the inspection process.